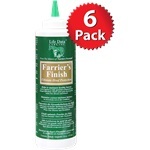 Farrier’s Finish® is a liquid hoof topical that combats the “hoof eating” bacterial and fungal invasions which cause white line disease, thrush, and poor hoof quality. It also supports correct hoof capsule moisture balance in excessively wet or dry conditions. Hoof cracks, old nail holes and poor hoof wall structure can allow microbes to invade resulting in crumbling hoof walls or white line disease. Thrush is a bacterial infection of the sole and frog often associated with wet environments. Many commercial hoof products use chemicals that denature and destroy the protective function of the hoof. Formaldehyde, turpentine, pine tar and acetone will harden the hoof and make it shine; however, they cause the hoof to lose some of its elasticity, shock absorption, and its ability to allow oxygen to pass into the hoof capsule. A hoof wall without elasticity is more prone to cracking, and a hoof wall unable to “breathe” naturally cannot maintain healthy moisture content. Farrier’s Finish® contains a unique blend of ingredients that defends against hoof-eating microbes while maintaining proper elasticity and shock absorption of the hoof wall. 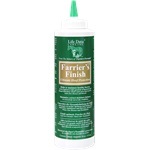 Farrier’s Finish® not only protects and disinfects the surface of the hoof, but it also penetrates deep within the hoof wall to combat microbes at the foundation of the invasion. Unlike other hoof care products, Farrier’s Finish® does not utilize harmful tar or petroleum ingredients. Available in a 16 oz (473 ml) bottle.